Autumn is finally upon us and boy let me tell you, I am excited. When I think of fall I think of pumpkin spice latte, binge watching movies all weekend under the covers, all the pretty hats and gloves I can wear, and let's not forget the boots too; those babies are finally coming out to play. Colours are less bright, tones are little darker and autumn after autumn, year after year, if there is one shade I always go back to that has to be Burgundy. Speaking of which, I just bought a jumper in this colour at New Look for £7.99; it's called "boxy jumper" and it is SO soft, so definitely check that out if you're currently as obsessed with cosy jumpers as I am! Anywho, going back to today's topic, burgundy is amongst the shades in Pantone's Colour Report For Fall 2016. to be exact Dusty Cedar is (just a fancy name for burgundy if you ask me) and according to Pantone, this shade gives a nod to the colour of the year Rose Quartz, which I already spoke about on the blog (see here and here). This Dusty Cedar colour is a fall/winter version of the pinks we were seeing in spring. It is a dustier rose-toned pink that exudes warmth and goes perfectly well with a bunch of different colour combinations. This is why I fell in love as soon as I laid eyes on this gorgeous skirt from Matalan. Not only is the skirt button down, which let's agree has been extremely popular this year thanks to fashion throwbacks to the 90s, I knew this would have been a piece I was going to wear non-stop this fall so in my shopping basket it went. To add yet another trend to this look, because I'm as audacious as one can be when wearing all black and a piece of colour, I went for this gorgeous yet very-old-bottom-of-the-drawer-slightly-forgotten-about Animal Print scarf from Zara. Now, animal print is a tricky one, especially if not done right. I actually went through a phase when I was rocking animal print, zebra and leopard included, from head to toe and I must say it was not my proudest moment. But having a more refined taste nowadays (at least I hope so), has made me look at the trend in a different way. Leopard Print was all over the fall/winter catwalks, from Prada fur coats to Dolce & Gabbana dresses - take my word for it, it was a huge hit- so I decided to give it a try. Now, I'm not yet ready to whip out my leopard print coat just yet (yes I actually have one of those and it must be at least 5 years old), but a little scarf never hurt nobody, especially when this burnt orange shade (Pantone's fall 2016 colour Potter's Clay) looks amazing against the burgundy skirt. To finish the look I added a similar shade cross body bag I dedicated an entire post about here and I love the final get up. 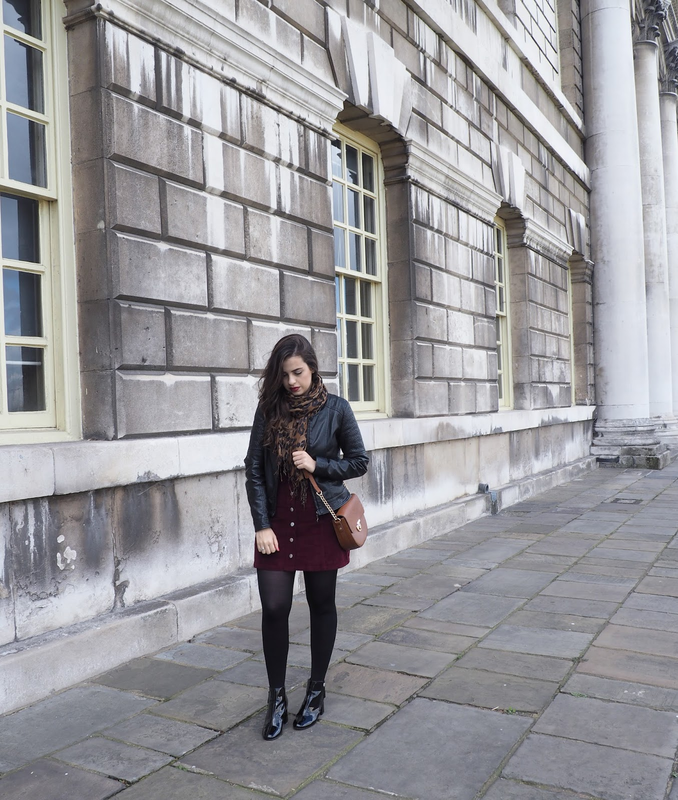 This outfit is perfectly comfy and ideal for a day outing like the one I had this past weekend with the fiancé, when we visited the Greenwich University campus to shoot some pics (which by the way may be the best ones here on the blog, what do you think?). Needless to say, I am obsessed with these colours and I'm in impatiently waiting for the cold weather to fully kick in. I have already ordered pants in a similar burgundy shade and I can't wait to wear them with boots and this leather jacket; expect to see this flawless colour combo a LOT from me this season. Tell me, what are your thoughts on burgundy and animal print for fall? Let me know below! 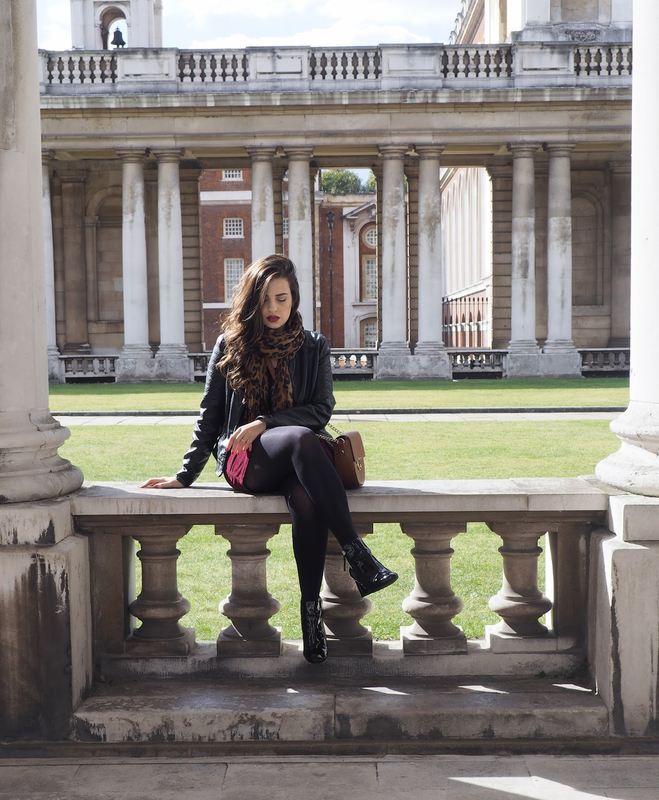 Great look Pam, love the Naval College too, a beautiful part of London! 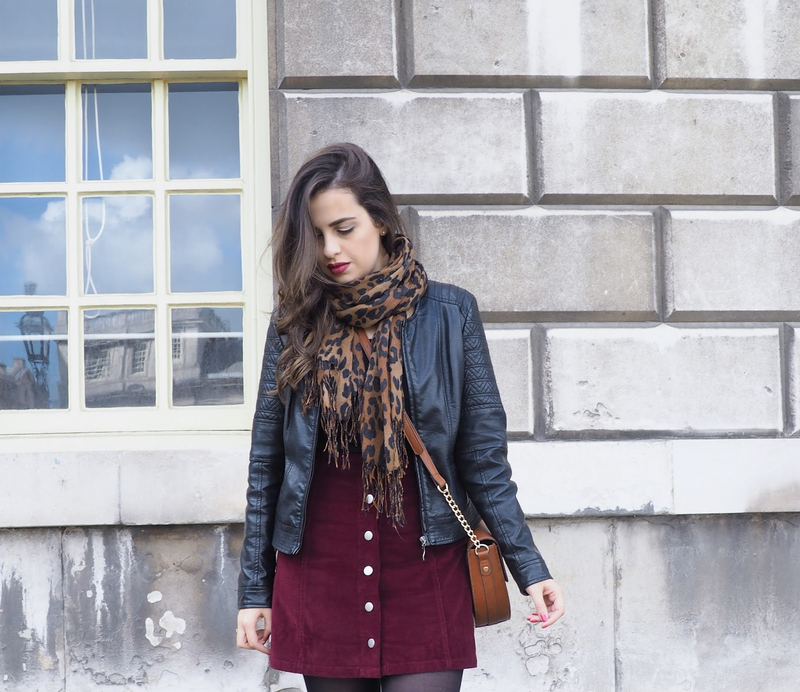 I love burgundy and animal print for autumn. Such great colours and prints. I can't wait to go shopping! Gosto do padrão leopardo de da cor burgundy. You look beautiful in this look hun! You look all warm and snug! I love the boots! Eeek! I can't wait to get them out to play!! I love the look! So much Style! Adorei o look! A saia é linda e das botas nem falo! Eu amei o seu look, que saia maravilhosa!! Why can't fashion just stay simple, burgundy means burgundy instead of another new fancy name? Ugh! That said, love your outfit here, Pam! You look absolutely lovely! I adore the skirt, definitely obsessed with the burgundy color as well! You look amazing, Pam! I love your skirt! Love the skirt and those shiny boots Pam! Gorgeous, gorgeous outfit, obsessed with it! The scarf compliments the skirt so well! Always love leopard print! You look gorgeous dear! 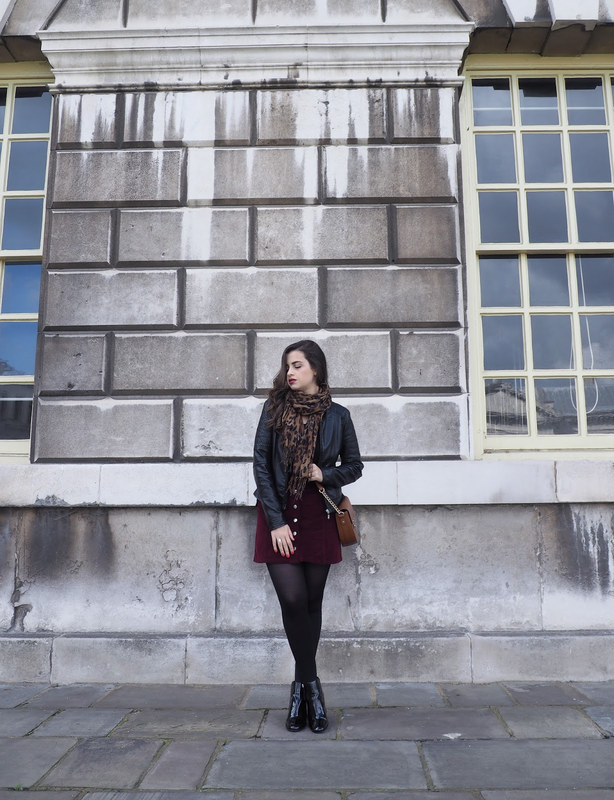 You look so beautiful in this outfit, Pam, the burgundy lipstick suits you perfectly! Cute outfit! Loved the scarf and skirt! 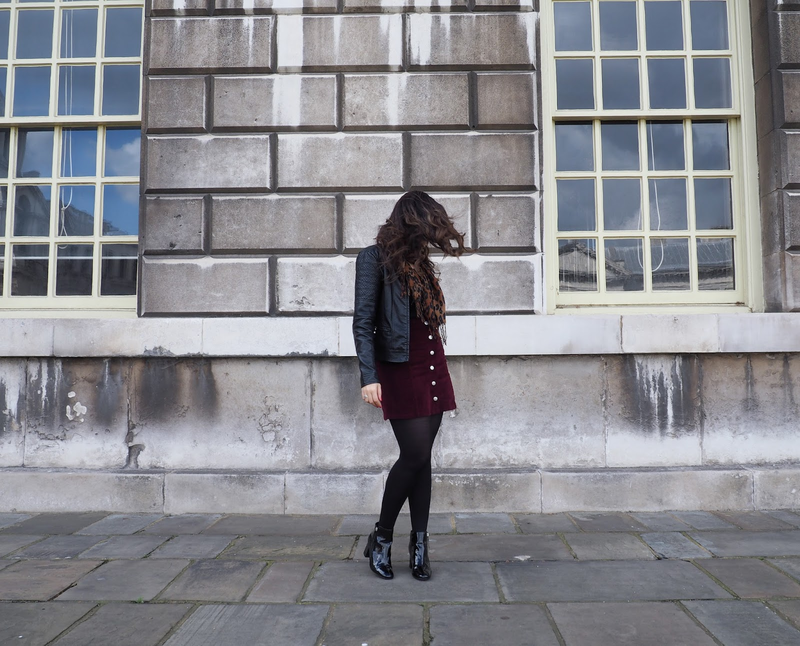 This is such an amazing blog post, LOVE your style. já estou a seguir! Adorei as fotos. My favorite combination for autumn - skirt and boots. I love the color and the pop of animal print with the scarf. It ties very nicely with the color of that bag too. Look lindíssimo!! Amei sua botinha!! You look so beautiful, dear Pam, and I loved your boxy jumper! Burgundy is such a beautiful color, one of my favorite colors - and yes, Pantone always makes up names for colors, like Dusty Cedar, such as rose quartz was or Serenity - my goodness, it was pale blue, but turned to be serenity :) OK, then :) I love leopard touches and I think you look really amazing - I am expecting to see you in some burgundy outfits this season! Hope you have a lovely day! Absolutely stunning look! Love the scarf and shoes! Such a pretty look, burgundy is always the main colour I think of when I think of Fall. I usually don't wear leopard print because like you said, it is tricky! I don't want to look OTT. But it's such a nice little touch to have a leopard print scarf. I am so obsessed with fall as well! Gosh that skirt looks soo good on you! Also, I seriously love your lip colors in like every single post!! That leopard scarf and black booties make for the perfect combination, we love how chic and beautiful you look! 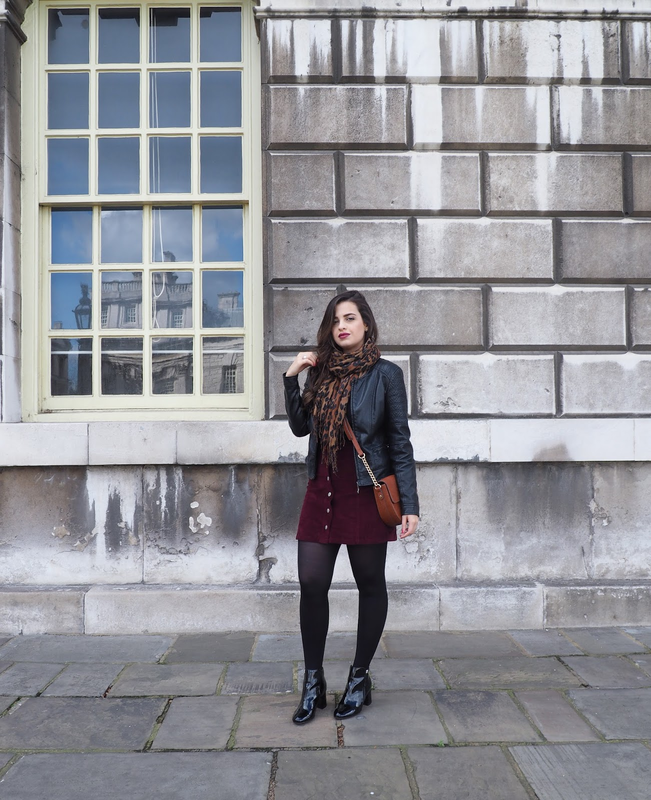 Burgundy and leopard print are two of my favorite things to wear in Autumn as well. And I am so glad you shared that skirt! I have been looking for one like that! Love how you added the print to the look! Love the midi dress, the color is good.